Experience Oz like never before in this collection of books ten through twelve in L. Frank Baum’s classic American fairy tale series. The tenth, eleventh, and twelfth titles of the iconic Oz series, now in one collection! In Rinkitink in Oz, Prince Inga of Pingaree must rescue his parents and all of the subjects from his kingdom who were kidnapped by marauders form Regos and Coregos. Prince Inga, along with the visiting King Rinkitink and Bilbil the goat, set off on a series of grand adventures that will lead them to the underground kingdom of the Nome King. Will Inga’s bravery and courage be enough to save his parents and all of their subjects? 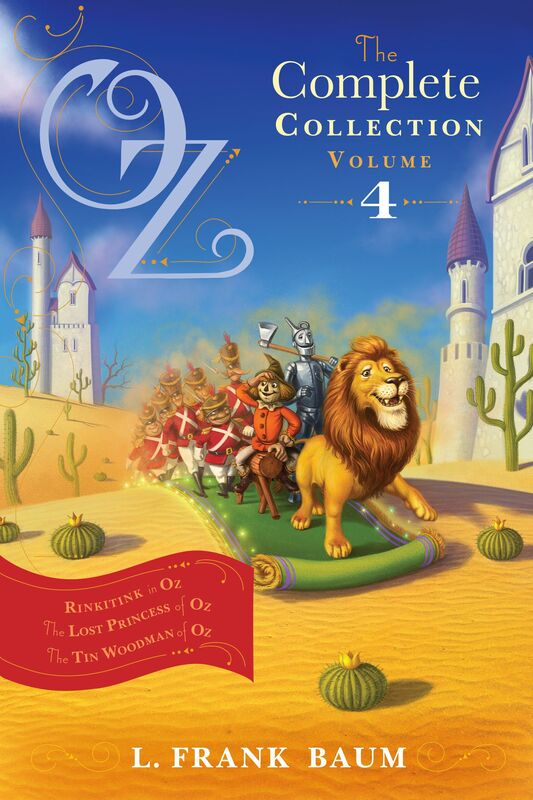 In The Lost Princess of Oz, Ozma, the beloved ruler of Oz, has disappeared, so Dorothy, the Wizard, the Cowardly Lion, and a band of friends must search the vast land of Oz to find her. In The Tin Woodman of Oz, Tin Woodman, Woot the Wanderer, and Captain Fyter set off on a quest to find the lovely Munchkin, Nimmie Amee. Once upon a time, she and the Woodman were going to marry, but then the Wicked Witch of the West turned him to tin. Can the Tin Woodman find Nimmie Amee? And will she remember him? f you have a map of the Land of Oz handy, you will find that the great Nonestic Ocean washes the shores of the Kingdom of Rinkitink, between which and the Land of Oz lies a strip of the country of the Nome King and a Sandy Desert. The Kingdom of Rinkitink isn’t very big and lies close to the ocean, all the houses and the King’s palace being built near the shore. The people live much upon the water, boating and fishing, and the wealth of Rinkitink is gained from trading along the coast and with the islands nearest it. Four days’ journey by boat to the north of Rinkitink is the Island of Pingaree, and as our story begins here I must tell you something about this island. At the north end of Pingaree, where it is widest, the land is a mile from shore to shore, but at the south end it is scarcely half a mile broad; thus, although Pingaree is four miles long, from north to south, it cannot be called a very big island. It is exceedingly pretty, however, and to the gulls who approach it from the sea it must resemble a huge green wedge lying upon the waters, for its grass and trees give it the color of an emerald. These pearls grew within the shells of big oysters, and the people raked the oysters from their watery beds, sought out the milky pearls and carried them dutifully to their King. Therefore, once every year his Majesty was able to send six of his boats, with sixty rowers and many sacks of the valuable pearls, to the Kingdom of Rinkitink, where there was a city called Gilgad, in which King Rinkitink’s palace stood on a rocky headland and served, with its high towers, as a lighthouse to guide sailors to the harbor. In Gilgad the pearls from Pingaree were purchased by the King’s treasurer, and the boats went back to the island laden with stores of rich merchandise and such supplies of food as the people and the royal family of Pingaree needed. The Pingaree people never visited any other land but that of Rinkitink, and so there were few other lands that knew there was such an island. To the southwest was an island called the Isle of Phreex, where the inhabitants had no use for pearls. And far north of Pingaree—six days’ journey by boat, it was said—were twin islands named Regos and Coregos, inhabited by a fierce and warlike people. Many years before this story really begins, ten big boatloads of those fierce warriors of Regos and Coregos visited Pingaree, landing suddenly upon the north end of the island. There they began to plunder and conquer, as was their custom, but the people of Pingaree, although neither so big nor so strong as their foes, were able to defeat them and drive them all back to the sea, where a great storm overtook the raiders from Regos and Coregos and destroyed them and their boats, not a single warrior returning to his own country. This defeat of the enemy seemed the more wonderful because the pearl fishers of Pingaree were mild and peaceful in disposition and seldom quarreled even among themselves. Their only weapons were their oyster rakes; yet the fact remains that they drove their fierce enemies from Regos and Coregos from their shores. King Kitticut was only a boy when this remarkable battle was fought, and now his hair was grey; but he remembered the day well and, during the years that followed, his one constant fear was of another invasion of his enemies. He feared they might send a more numerous army to his island, both for conquest and revenge, in which case there could be little hope of successfully opposing them. This anxiety on the part of King Kitticut led him to keep a sharp lookout for strange boats, one of his men patrolling the beach constantly, but he was too wise to allow any fear to make him or his subjects unhappy. He was a good King and lived very contentedly in his fine palace, with his fair Queen Garee and their one child, Prince Inga. The wealth of Pingaree increased year by year; and the happiness of the people increased, too. Perhaps there was no place, outside the Land of Oz, where contentment and peace were more manifest than on this pretty island, hidden in the bosom of the Nonestic Ocean. Had these conditions remained undisturbed, there would have been no need to speak of Pingaree in this story. There was no school upon the island, as the people of Pingaree were far removed from the state of civilization that gives our modern children such advantages as schools and learned professors, but the King owned several manuscript books, the pages being made of sheepskin. Being a man of intelligence, he was able to teach his son something of reading, writing and arithmetic. When studying his lessons Prince Inga used to go into the grove near his father’s palace and climb into the branches of a tall tree, where he had built a platform with a comfortable seat to rest upon, all hidden by the canopy of leaves. There, with no one to disturb him, he would pore over the sheepskin on which were written the queer characters of the Pingarese language. “Are we, then, less powerful than in my grandfather’s day?” asked Prince Inga. “I shall not forget,” said Inga. Then the King returned the pearls to their hiding place and the boy went to his own room to ponder upon the wonderful secret his father had that day confided to his care.